Tables are an extremely useful means of presenting information, and it’s possible to make tables that are readily accessible to users with a wide variety of disabilities. Poorly designed tables, however, can fail even to convey information to conventional users, let alone a user who has to navigate with a joystick. Most of us are not graphic designers, so it’s easy to rely on tables as a layout feature, and not specifically as a means of formatting a specific set of tabular-style (columns and rows) information. Unfortunately, it’s also very possible to make tables that hold out the promise of equal access, but are, in fact, maddeningly broken in one way or another. While well-designed tables are more accessible to everyone, we don’t always get to re-make the tables; we have to remediate the tables we’ve been given. The good news is that CommonLook PDF includes the most advanced PDF table structure editor there is, and it can help you remediate even the most complex and poorly-designed tables with confidence. The table structure is like a list. There is a main tag in which everything is contained. The main tag is <TABLE>. Table rows <TR> are next, and table cells exist inside of the row. 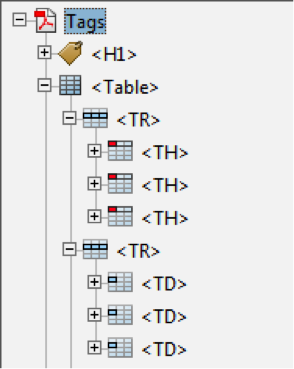 The tag <TD> stands for table data and is equivalent to a table cell. Text runs reside inside of a <TD> tag. The <TH> tag designates a table header. This tag is used instead of <TD> for the column and row headers. When are Table Tags Appropriate? The information is not tagged as a table at all. A single table has been split into two, or one table needs to be split into two. The Row or cell alignment is not correct. Rows, columns or cells need to be individually added to a table or removed to correct. This will ensure data is aligned under the correct column headers. The table headers have not been correctly identified. Is it a data or presentation table? If it is a data table, where are the headers? Would the data be clearer if it was split into two tables? Compare your answers to the current tag structure. Assign column headers, combine data into cells, and change the table structure by adding/removing cells and rows if necessary.